How much would you pay for an a la carte subscription to HBO? Jake Caputo wants to know—and then have you tweet it straight to HBO. Since the creation of HBO's wildly popular series Game of Thrones, there has been a rather large groundswell by non-HBO subscribers clamoring for a stand-alone subscription-based service to HBO or its much-praised app, HBO Go. Many tech-savvy GT fans—including prominent tech blogger and investor M.G. Siegler—have argued that they don't feel right pirating the show but are left with few options as new seasons take months, if not years, to become available online. The idea has caught on and sites like Torrent Freak show that GT's first season was the second most pirated television show of 2011 and Season 2 stands to be the most pirated show of this year. 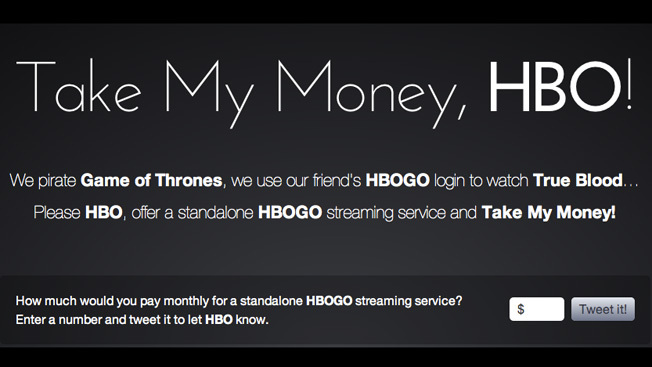 Web designer Caputo decided to take matters into his own hands late last night, launching Take My Money, HBO, a Web page that allows users to tell HBO just how much they would pay for a stand-alone subscription service and tweet the number to HBO under the hashtag #takemymoneyhbo. So far the traffic results are pretty staggering. In just over 11 hours, the site is just shy of 60,000 visitors. Adweek spoke to Caputo about the project via email hours after the creation of the site. What motivated you to create the site and make this happen? What inspired it was the fact that I wanted to watch HBO, but the only way I could legally do so was to get a cable or satellite service, which I don't have or want, and then spend the extra money on top of that to subscribe to HBO. I'm happy with my roughly $18 I spend a month for Netflix and Hulu and don't want to shell out $75 to get a bunch of channels I don't want and HBO. Do you think grassroots efforts like this one can actually have an effect on a company like HBO? Wouldn't it be easier for me to pay $20 or even $30 a month just for HBO? I think so, and hopefully if people come out in droves on Twitter, we can prove that point. I've read that it's not really feasible for HBO to do that, but there's always a way to do anything … especially if you have clout like HBO. What are you seeing as the average price people are willing to pay for a stand-alone subscription? So far, just shy of 11.5 hours of being live, I've had just under 60,000 visits. A Twitter follower also wrote a script and found the average willing price was about $12.30. That's $738,000 a month "pledged" by people who want to give HBO their money. How is HBO not allowing this to happen? HBO has yet to put forth any sort of statement about the site, and probably won't. The reality, as pointed out last night by people like TechCrunch's Ryan Lawler, is that HBO relies too heavily on cable companies to distribute and prop subscribers up with free or trial subscriptions. While there is great proof that HBO could be charging more if it had a stand-alone subscription service, there are far too many negatives for HBO to cut out cable providers. However, Caputo and at least 60,000 others are hoping things will change.